And while I’m not trying to rush my most favorite holiday away, I know that by tomorrow evening, you could very well be stranded in your kitchen with piles and piles of delicious Thanksgiving leftovers, and no desire to spend hours in the kitchen dealing with them all. So instead of letting them go to waste (or eating traditional Thanksgiving dinner every night for the next 2 weeks) I thought I’d share a bunch of simple recipes and ideas I use to repurpose our yummy Thanksgiving leftovers! Also, I’d highly suggest roasting your turkey breast DOWN — it’s SO juicy and flavorful! Freeze it in ice cube trays and use it to add flavor to other beverages later on, or use it too chill (without watering down) punch the next time you make it. Pretty much any other soups, stews, casserole, etc. Top leftover mashed potatoes with cheese and bake them for a super simple side dish. We love this yummy chicken and stuffing (or turkey and stuffing) casserole. You can use chicken or turkey for any of the recipes listed below. NOTE: here’s my amazing tip for shredding boatloads of leftover chicken or turkey in seconds! Use the gravy for hot chicken or turkey sandwiches as mentioned above. Hopefully this gives you a few creative ideas to use up some of your leftovers! 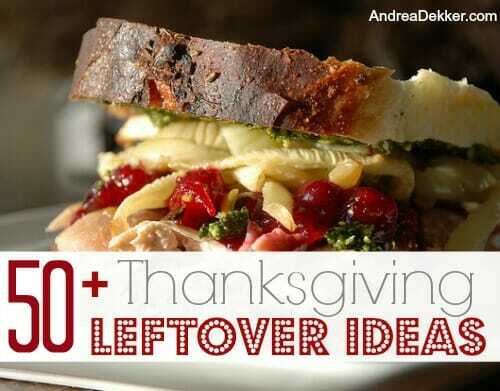 What are your favorite ways to repurpose Thanksgiving leftovers? FYI-I freeze apple pies all the time! It works pre cooked or afterwards too! We usually go back to my father-in-laws the next day and maybe even the next if there is food. We never have leftovers after that. My Mom has always made a big pot of Turkey frame soup with the leftover turkey meat. It’s made just like old fashioned chicken and vegetable soup. She adds any leftover vegetables like butterbeans and corn. She puts several quarts in the freezer and there is plenty to go around. I’ve started making this soup as well, It’s my favorite soup! Hope you and your family have a wonderful Thanksgiving!!! sounds a lot like my chicken and rice soup — delicious! !